Ancient Rome was a powerful and important civilization that ruled much of Europe for nearly 1000 years. 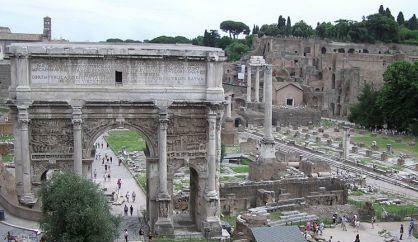 The culture of Ancient Rome was spread throughout Europe during its rule. As a result, Rome's culture still has an impact in the Western world today. The basis for much of Western culture comes from Ancient Rome, especially in areas such as government, engineering, architecture, language, and literature. Rome first grew into power as a Republic. This meant that Rome's leaders, such as senators, were elected officials that served for a limited amount of time, not kings who were born into leadership and ruled for life. They had a complex government with written laws, a constitution, and a balance of powers. These concepts became very important in forming future democratic governments, like the United States. The Republic would rule Rome for hundreds of years from around 509 BC to 45 BC. In 45 BC Julius Caesar took over the Roman Republic and made himself the supreme dictator. This was the end of the republic. A few years later, in 27 BC, Caesar Augustus became the first Roman Emperor and this was the start of the Roman Empire. Much of the lower level government stayed the same, but now the Emperor had supreme power. As the Roman Empire grew it became more and more difficult to manage from the city of Rome. Eventually the Roman leaders decided to split Rome into two empires. One was the Western Roman Empire and was ruled out of the city of Rome. The other was the Eastern Roman Empire and was ruled out of Constantinople (today's Istanbul in Turkey). The Eastern Roman Empire would become known as Byzantium or the Byzantine Empire. The fall of Rome generally refers to the fall of the Western Roman Empire. It fell in 476 AD. The Eastern Roman Empire, or the Byzantine Empire, would rule parts of Eastern Europe for another 1000 years. The city of Rome is the capital of Italy today. It sits on the same site as the city of ancient Rome. If you were to visit Rome you could see many of the original ancient buildings such as the Colosseum and the Roman Forum. The Circus Maximus, a huge stadium built for chariot races, could seat around 150,000 people. The fall of Western Rome is considered the start of the "Dark Ages" in Europe. The highest position in the Roman Republic was the consul. There were two consuls at the same time to make sure that one didn't become too powerful. The native language of the Romans was Latin, but they often spoke Greek as well. When Julius Caesar took power he named himself dictator for life. However, this didn't last long as he was assassinated a year later. Nature Company Discoveries library: Ancient Rome by Judith Simpson. 1997. Exploring the culture, people & ideas of this powerful empire by Avery Hart & Sandra Gallagher ; illustrations by Michael Kline. 2002. Eyewitness Books: Ancient Rome written by Simon James. 2004.